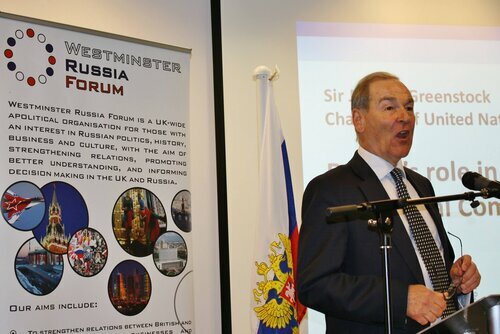 Richard Royal, Chairman of the Westminster Russia Forum, reports on an event with Sir Jeremy Greenstock, Chairman of UNA-UK. The role of Russia in the United Nations has been a pertinent topic throughout the organisation’s 68 year existence, where both the Soviet Union and subsequently Russia have at times had a turbulent relationship, but is particularly relevant of late with issues such as Iran, North Korea and Syria dominating headlines and often splitting global opinion. 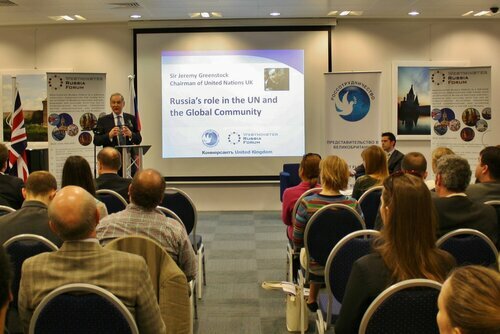 A recent Westminster Russia Forum event saw this topic addressed by Sir Jeremy Greenstock, a former British diplomat of 35 years standing who had acted as both UK Ambassador to the United Nations and Special Envoy to Iraq. His current role is as Chairman of the United Nations Association in the UK, an organisation which analyses, supports and promotes the wider work of the UN within Britain. Greenstock did not disappoint, delivering one of the most fascinating, wide-ranging and philosophical analyses of the international political arena that I have heard in years. Before progressing onto specifics he took the audience on a magical mystery tour through his macro-world view. Much of the planet’s civil-organisational structure as we know it is breaking down, whilst globalisation travels in a contrasting direction, he says. As a result we have entered an era of greater freedom where we must recognise that ‘the people’ have a voice and their consent is of increased importance. Governments and institutions no longer have a monopoly on infrastructure, violence or respect, and those that repress freedoms lose legitimacy. This could certainly be deemed true of the current situation in Russia where reports of the curtailment of personal and press freedoms have led many to question Vladimir Putin’s mandate. But it also applies to the misleadingly named ‘Arab Spring’ – a collection of very different revolutions with no summer in sight. Unusually for a British diplomat, Greenstock is critical of Western actions in the Middle East where he confesses there has been a series of bad governments removed without any clear idea of who or what might replace them. This has notably caused us problems in Iraq and Afghanistan, prolonging our involvement way beyond what was planned or hoped for. Russia was of course painted as obstructive for questioning the evidence, motivations and legitimacy for action in Iraq. Its restraint is now seen in a different light. Similarly with regard to Syria, whilst Russia needs to do more to oppose and condemn the Assad regime, its argument that we are foolish to simply overthrow one dubious group with another is one worth seriously considering. The opponents of devils are not always angels. Yet too often the West views the United Nations as an extension of US Foreign Policy by other means with the added benefit of greater apparent legitimacy. It is necessary to remind ourselves that the UN is actually a collection of 193 states, all of whom require representation in addition to occasionally needing protection from such unilateral and unconsidered policies themselves. Russia promotes itself as the champion of the disenfranchised nations in the General Assembly and has often been ridiculed for its claim to be the upholder of international law, insinuating that the likes of the USA and UK are on the wrong side of the legal fence. Sir Jeremy Greenstock supports Russia’s assertions though. He argues that it has consistently promoted international law and defended the sovereignty of independent states. Albeit it’s arguments for non-intervention that are largely motivated by self-interest and the desire not to set a precedent that might justify the involvement of foreign powers in the more agitated Russian Republics. Nevertheless, it manages to promote its national interests clearly in terms that do not undermine the collective nature of the United Nations. By contrast, the United States is not habitually a collective player on the international scene, he asserts. Returning to his arguments about globalisation and organisational breakdown, he believes that Washington is more concerned with the voice (and votes) of its people, amplified and warped by the media, than by international law. Surely such an argument undermines the drive for greater democracy? “I don’t believe in promoting democracy in its Western form throughout the World” he states, refreshingly. The reality is of course that history, culture and customs differ globally, and this has to be taken into account by varying forms of Government. The consent of the people is important but is not always projected in the same way. Greenstock argues that China is a classic example of the people having ‘consented’, albeit latently, to the surrendering of certain democratic rights and freedoms in return for the stability and order that its Quasi-Communist regime brings them. Could the same be true of Russia? He falls short of making this suggestion, but it has long been argued by commentators and analysts that Russia is a country that demands strong authoritative government. It is clear that this is the sort of regime that President Putin has tried to reassert after the chaos of the Yeltsin years. It relies not only on internal strength but also on external power-projection. As George Orwell noted, “one often justifies and perpetuates the other”. Russia and America have certain similarities in this respect and the permanently bubbling hostility towards one another helps politicians on both sides to validate domestic and foreign policies that would otherwise be unacceptable. The difference between the two on the international stage is that the Americans are proactive in their attempts to resolve perceived problems, whereas Russia seems happier to live with the status quo as long as it has no direct negative effect on them. The difficulty with Russia’s role in the United Nations and in the global community in general, is that it is “the most powerful destructive voice” according to Greenstock, who is disappointed by the rarity with which such an important country is constructive rather than dissentient. To have the might of Russia on your side of the argument is hugely important and powerful, which is why its opposition is so frustrating. It also has a strong hand when it comes to key players. Greenstock is hugely admiring of his one-time opposite number Sergei Lavrov, now Putin’s Foreign Minister. He believed Lavrov to be the most powerful voice on the Security Council, with a sharp mind and great ability in debate. Like the country he represents, he is a tough adversary, although he is apparently not close to the President, which he may find beneficial in the long term. So what exactly is Russia’s role within the UN, and what lessons need to be learnt? If we look back at the original purpose of the UN, set out in the first article of its charter, we find the aim to “maintain international peace and security … to take effective collective measures for the prevention and removal of threats to peace … and for the suppression of acts of aggression and other breaches of the peace”. Has Russia fulfilled this duty? In a word, ‘No’. In more than a word, just as much as anybody else has. For Russia, the threat to peace and the acts of aggression just as often come from those claiming to prevent it. The Assad Regime; the prospect of a nuclear Iran; the brinksmanship of North Korea; and the many modes of widespread terrorism are all threats to peace. But so are the arming of rebels in Syria; Israeli missile attacks on its neighbours; threats of air-strikes on Iran; the general moral relativism applied to the Middle East; and aspects of the ‘War on Terror’. The key part of the UN’s first article is “effective collective measures”. There is no doubt that several international actions in recent decades have simply not been effective in delivering their intended aims. Russia sees this, as do an increasing number of nations and discontented citizens around the world. It is unwilling to put its support behind an action it expects to be ineffective. And as such, the action cannot be collective. Given this, Moscow is perfectly within its right to question, criticise and even veto decisions that could send hundreds of thousands of humans to their deaths on the basis of flimsy reasoning. It may however attract fewer critics if it gave more consideration to proposing ways to re-route the traffic rather than just placing down a road-block sign and walking away. 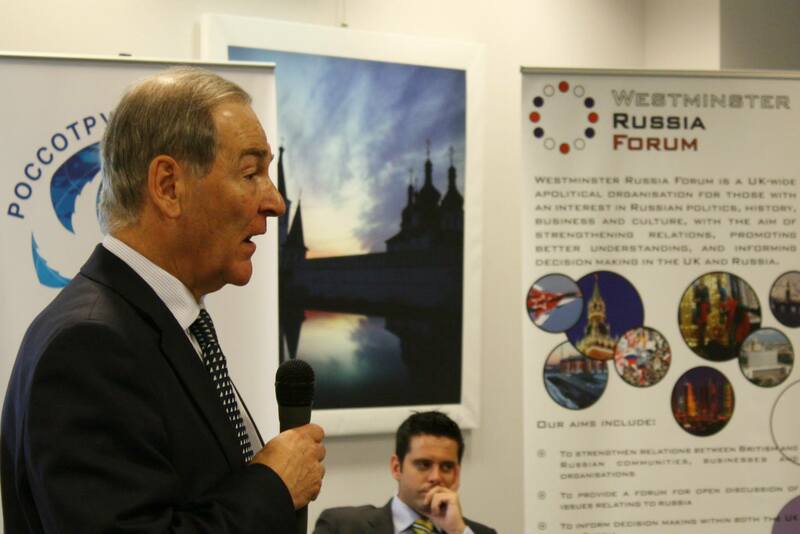 Richard Royal is Chairman of the Westminster Russia Forum (www.wrforum.org.uk).